With so many occasions of countries playing in consecutive finals, it’s really not that difficult to think of players who would have also done so. Membership of that particular club may will be limited, but it’s hardly exclusive. If we tweak the question a little though and enquire instead about players who have played in consecutive finals, but for two different counties, we’re in a totally different range of numbers. We’re talking one. If you don’t know the answer, it’s Luis Felipe Monti, who starred for Argentina in the first ever World Cup Final in 1930, and then for Italy four years later. On its own, that unusual enough to be worthy of looking further into the events. Add in the fact that he played both games after being issued with death threats, and there’s bound to be a good story in there somewhere. Luis Monti was born in Buenos Aries in May 1901 and began his footballing career with local club Huracán, winning his first championship in his only season at the club before moving on to Boca Juniors the following year. It was a brief stay with the Azul y Oro, pausing only for three months at the club, and without ever making a first team appearance, before moving on to his different third Buenos Aries club in less than four months, when he joined San Lorenzo. It was with the Azulgrana that Monti, still only just turned twenty years of age, would develop into an outstanding footballer. A rugged and robust player when his team did not have the ball, once in possession he had a technical skill rare in a player of his type. His dynamism across the pitch in pursuit of his team’s aspirations saw him gifted the sobriquet Doble Ancho – meaning double wide – as a recognition of the space he covered for his team. His abilities meant he could be deployed either as a centre-half or defensive midfielder for the team, with his physique, robust defending and an aptitude to read a game making him ideally suited for either role. In his time at the club many an opposing forward was compelled to visit the treatment room after unwisely tangling with Doble Ancho. There was more to Monti’s play then merely being a defensive rock at the back. He also had the ability to play in front of the back line, acting as a shield for the defence, possessing the ability on the ball to spark off attacks for his own team. In modern parlance, it would translate broadly as partly a ‘defensive midfielder’ with a bit of a ‘quarterback’ ability thrown in. It was a talent that would be recognised and particularly exploited on the other side of the world later in his career. His early years with the club were a glorious time for San Lorenzo. With Monti an essential part of the team they took successive championships in 1923 and 1924 to the Gasómetro, also adding a third in 1927. At this time, the game in Argentina remained officially amateur, although there was an irreversible drift towards professionalism, with the lines between becoming increasingly blurred to the point of invisibility. As well as being a footballer, Monti was also employed by the local municipality, but even with two salaries coming in, totalling around $200 per month, he was hardly a wealthy man and when the opportunity came to exploit his talents for much richer rewards, it was an offer he could hardly refuse. In his second season with San Lorenzo, his talents were recognised by national manager Angel Vázquez, and he was called up to the Argentina team in 1924. Three years later, he would be part of the team that won the South American Championship with the Albiceleste and also gained a silver medal in the Olympics of the following year. Another key player in this classic Argentine team was Raimundo Orsi. Then playing with Club Atlético Independiente of Avellaneda, Orsi would be a trailblazer for Monti when he left South America for the riches being offered in Italy, joining Juventus in 1928 and becoming part of the Oriundi movement of players around this period, who switched allegiance to Italy from Argentina due to an obliging ancestry. Monti would later follow the same path, arriving in the Azzurri shirt, and being part of Italy’s attempt to win the World Cup on home soil in 1934. Before then though, there was still Argentine matters to consider. By the time the inaugural World Cup tournament took place in neighbouring Uruguay in 1930, Luis Monti was widely considered to be one of the best centre-halves in South America and a vital component in the Argentina team. They opened their tournament against France and it was Monti who scored the only goal of the game with just ten minutes remaining to set the Albiceleste on their way to skate through their initial group. The second game saw Argentina thrash Mexico 6-3, before completing a clean sweep, defeating Chile 3-1, and sending them into a semi-final against the USA. Both of the last four games saw overwhelming victories for South American sides. In the other game, hosts Uruguay defeated Yugoslavia 6-1, and another goal by Monti set Argentina on the road to a similarly emphatic score line over the Americans. There was little doubt therefore that the final between the hosts and Monti’s team would indeed be a match-up between the two best teams in the tournament, with the winners to be inaugurated as the first FIFA-sanctioned champions of the world. At the time, Uruguay had been the dominant force in world football, reigning Olympic in both 1924 and 1928 – when Monti and the Argentina team lost out in the final to the Celeste following a replay in Amsterdam after a 1-1 draw. Monti had brought Argentina level in that second game, equalising just before the half-hour mark, ten minutes after Roberto Figueroa had put Uruguay ahead, but a late goal by Héctor Scarone would see the reigning champions to gold once more, and mean a runners-up spot, and silver medals for Argentina. Two years later, Luis Monti and his team-mates were set on putting the record straight. The game took place on 30 July 1930 in the Estadio Centenario, Montevideo in front of more than 68,000 fans, with the vast majority there hoping to see Uruguay confirm their status as the world’s premier footballing nation. Twelve minutes in, it looked like the desired result was on the cards, when a shot from Pablo Dorado squirmed between the legs of Argentine goalkeeper Juan Botasso to put the hosts ahead. Argentina were made of stern stuff though and by the time the referee brought the first-half to a close, they had not only equalised, but also gone on and taken the lead. Firstly, on 20 minutes, Carlos Peucelle converted a cross at the far post to being the visitors level. Then, eight minutes before the break, a shot from distance by Guillermo Stábile – who would end as the tournament’s top goalscorer – flew past home ‘keeper Enrique Ballestrero to quieten the crowd and send the visitors to the dressing room with a lead to defend. The very fact that Argentina then went on to concede three goals in the second period for Uruguay to run out winners 4-2, suggests that all may not have been well. Monti himself, would offer a potential explanation for what some saw as a collapse in the second-half as Uruguay romped to the title. Much later, Lorena Monti said that her grandfather had spoken many times about threats that had been received during his playing career in order to influence the outcome of games. The one regarding the 1930 World Cup Final, related by her grandfather, seems the poignant in her memory though. “At half-time, when Argentina were leading 2-1, they said that if Argentina didn’t lose, they would kill my grandmother and my aunt.” It’s easy to sit back and say players shouldn’t be influenced by such things, but a principled stance in the abstract, may not be sustainable if truly placed in such a dilemma, and certainly in times when law and order may not have been so prevalent. Monti also told his granddaughter that many of the other Argentine players had received veiled threats, but nothing as specific as the one delivered to him. Did the threat make a difference to Monti’s performance and the outcome of the game? If it happened, it’s surely difficult to imagine that it had no effect at all on the player. Monti was key to the Argentine aspirations, and the person behind the threat knew the player to target if the result was to be influenced. Uruguay lifted the trophy, and Monti’s family was safe. He would surely have been disappointed not to be world champion, but there may also, understandably, have been a large measure of relief. With the World Cup over, Monti was to return to San Lorenzo and continue his career, but a visit from two Italians was to change all that. Although the professional game was finding its feet in South America, over in Serie A, with Calcio on the rise and often seen as a tool for the glorification of the burgeoning Fascist state, money was much more influential and the lure of the lira was about to snare another victim. The story goes, that Monti’s visitors advised him that he would shortly receive an offer from an Italian club and, if he accepted, his salary would climb to $5,000 per month, dwarfing his current income. Additionally, he would also receive a house, a car and other bonuses. To add to the authenticity of the upcoming offer, it was also apparently suggested to him that the person promoting the deal was none other than Benito Mussolini. The next World Cup would be held in Italy, and with the Fascist dictator’s declared aim of raising the Italian nation to the forefront of the world powers, a victorious World Cup campaign for the Azzurri would be the required outcome. Monti had Romaganol ancestry, going back to the Emilia-Romagna area in the northern half of Italy and with the Oriundi recruitment drive already underway to take qualified foreign players to the country, Monti would be the next piece of the jigsaw. When the offer landed with Monti, it was from Turin club, Juventus. Some may consider this a little strange if Mussolini had been the man behind the plan, as his favoured club was Lazio. The situation may be explained though by the fact that this was about nation and Italian prowess, rather than mere football club allegiances. It’s unclear whether the requirement to take up Italian citizenship was part of the deal, but whichever was the case, Monti moved to Turin and became an Italian citizen, qualified now to turn out for the Azzurri. He had played 16 times for his native Argentina, scoring five times, but all future appearances on the international stage would be for his adopted country. Monti joined Juventus in 1932, falling under the managership of Carlo Carcano, but upon arriving in Turin, the club were disappointed to discover that their new supposed star player was overweight and clearly unfit. He was detailed to take a month’s intensive training to get him into the required shape. Once completed he was ready to display skills and show The Old Lady, what her money had bought. 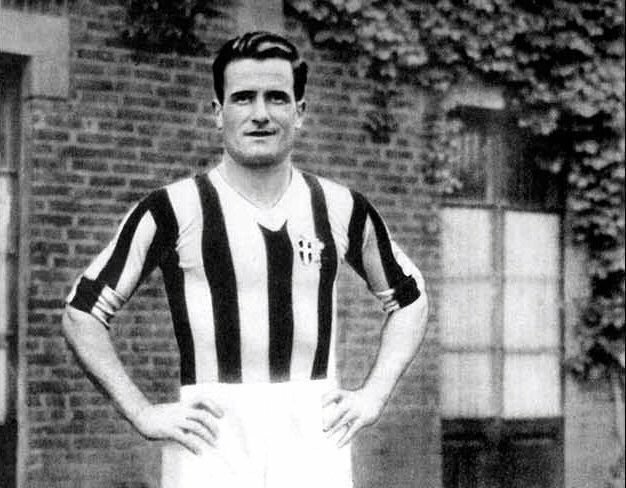 Not only did Luis Monti become a key player of the Bianconeri deployed in his midfield role, he was also made captain of the team as Juve won four successive Serie A championships from 1932 to 1935. During a nine-year career in Turin, he would play more than two hundred games, netting 20 goals from his broadly defensive position. Just twelve months after moving to Turin the full significance of the change in national allegiance was completed. Monti was selected to play football for Italy. Vittorio Pozzo was the man charged with delivering the desired success for the Azzurri, and he saw Monti as an ideal player for the ‘attacking centre-half’ role in the Metodo system he was deploying with the Azzurri. Based on a 2-3-5 formation, Pozzo knew that in order for his half-backs to gain control of the midfield area, he would need to reinforce their numbers by drawing back two of his forwards into the middle of the team, thus creating a 2-3-2-3 look to his team. Not only did this strengthen the defence, it also allowed a quick transition from back to front, facilitating counter-attacks when possession was regained; in essence, moving the heart and creativity of the team into the midfield. Pozzo saw Monti as key in this system providing the link between Bologna defender Eraldo Monzeglio – who would be one of the answers to the initial quiz question at the start of this article, as he played in winning Italian teams in successive World Cup Finals in 1934 and 1938, and was also rumoured to have a close relationship with Mussolini – and Internazionale’s legendary forward, Giuseppe Meazza. It was a system that Monti fitted into like a hand in a glove, which was just as well for all concerned, as Il Duce would not take effort as sufficient. Success was required for his – and Italy’s – team. On 27 June, Italy began their World Cup campaign in the now defunct Stadio Nazionale PNF, named for the Fascist Party, with a first round match against the United States, cantering to an emphatic 7-1 victory. Whilst Monti didn’t get on the scoresheet himself, his fellow Oriundo, Raimundo Orsi netted a brace. The same day, at Bolgona’s Stadio Littoriale, Argentina, bereft of their best players cherry-picked by the Italians, and without a single member of the team that had been beaten by Uruguay in the Final four years earlier, were eliminated by Sweden, 3-2. In the quarter-finals, Italy faced a Spain team replete with star names. Iconic players from the Iberian Peninsula such as Bosch and Lángara were amongst their number and legendary goalkeeper Ricardo Zamora – after whom the prize for the best goalkeeper in Spain is named – was their custodian between the sticks. The game was robust in the extreme, with both teams perhaps fearing what the ability of their opponents could do to damage their aspirations. To say either team shirked the physical aspect would be untrue, but with huge pressure on the match officials to favour the home team, a number of reports suggest that the Italians were more the instigators than retaliators. That said, Fiorentina midfielder Mario Pizziolo had his leg broken by a Spanish challenge that prematurely curtailed his international career at just 24 years of age. The game ended in a 1-1 draw. Basque born Luis Regueiro had given Spain the lead on the half-hour mark, but Monti’s Juve team-mate Giovanni Ferrari equalised just ahead of the break. A replay would be required. The fallout from the first encounter was revealed when the Spanish team was announced for the second game. Half-a-dozen of their first-choice players – including Zamora – were absent. Tempers hadn’t cooled from the first encounter, and during the game no less than three Spanish players had to leave the field after being injured. Italy eventually won out in a snarling and bitter encounter thanks to a solitary goal by Meazza. Regardless of the bumps – and many bruises – on the road though, Italy, together with their Oriundi, were through to the last four of the tournament, two of which would be key elements in deciding the game against Austria. Orsi had already made his first contribution in the game against the USA, netting two goals in that first-round romp, now it was the turn of both Monti and Enrique Guaita, who had followed the other two Oriundi on the road from Argentina to Italy, when he joined Roma in 1933. The Austrian team at the time had rose to prominence in Europe under the astute management of Hugo Meisl. Christened as ’Der Wunderteam’ they played a neat passing game based on the ability of all of the players being able to follow the ethos. Some have referred to the Austrians as the pioneers of the type of play described Totaal Voetbal and famously used by the Ajax and Dutch teams of the early seventies. At the apex of the Austrians team, in more ways than one was Matthias Sindelar. Centre-forward and inspirational leader of the team, Sindelar, due to his slight frame was known as Der Papierene (“The Paper Man”), but his effect on the way the Austrian team played was anything but lightweight, and if Italy were to overcome the extravagant skills of their neighbours from across the South Tyrol, a successful man-marking job on Sindelar would be required. It sounded like a job for Luis Monti, and that’s how Pozzo saw it. Perhaps at this stage the Austrians were slightly past their best, but they were still a team of high quality, and it would be a game between their ability to play to their best, and the rugged athleticism of the Italians. On a day when rain soaked the San Siro in Milan, the silky football of Austria was already compromised by the conditions, but it took Monti’s nullifying on Sindelar’s threat to keep the Austrians at bay. It was a task he fully succeeded at. Although Austria had plenty of possession with Sindelar restrained by Monti’s attentions, there was a lack of bite to their attacks, and the game was decided by a single, if somewhat controversial, goal. After already being robustly challenged by both Meazza and Guita whilst trying to deal with high balls into the Austrian box, goalkeeper Peter Platzer was again clattered by Meazza in the nineteenth minute. A low cross saw the ‘keeper fall onto the ball near the goal line. Meazza crashed into the fallen Platzer and jarred the ball loose from his grasp. It rolled against the past and Guita stabbed it home for the winning goal. After the game, Swedish referee Ivan Eklind was criticised for favouring the Italians, not least for their goal. Unsurprisingly perhaps, it did him little harm, and he was also selected to officiate in the Final where Italy – together with their Oriundi – would face Czechoslovakia back at the Stadio Nazionale PNF in Rome. The Final took place on 10 June 1934, but on the day before, a telegram arrived at the team’s hotel, addressed to both Pozzo and the team. It read: “Victory or death Gentlemen, if the Czechs are correct, we are correct, that first of all. But if they want to win bullying us, the Italian must hit, and the opponent must fall…Good luck tomorrow, guys. Win. If not so, crash.” It was a chilling reminder of how important the game on the following day would be, not only for football, but for the Fascist powers in Italy. The telegram was signed by Benito Mussolini, and few doubted the implications of the word “crash.” In the biggest game of their lives, the pressure on the Azzurri players had been ratcheted up even further. The following day, ahead of the match, Puccini’s Himno al Sole (Hymn to the soul) was played in front of 55,000 spectators – mainly donned in the Fascist black shirts – and the song was echoed to the chorus by the crowd. It was enough to remove any lingering doubts in the minds of Monti and his team-mates as to how vital victory was in the game. The consequences of the other outcome were too terrible to contemplate. The problem was however that no-one had told the Czechs what their anointed role was to be in the passion play to come. They had already defeated the other half of what would become the Rome-Berlin Axis a couple of years later, when Hitler’s Germany team were defeated in the semi-final. In a parody of the latter agreement, the match was refereed by an Italian, Rinaldo Barlassina who, a number of reports suggest, favoured the weaker Czech team to assist them on their way past Germany and offer Italy an easier opponent in the final. When the game got under way though, that didn’t seem to the be case. Black and white videos of the game are less than totally helpful, with the home team in their traditional blue shirts and white shorts and Czechoslovakia in red shirts and white shorts, monochrome reproduction offers little aid to the analysis, but whether unsettled by the added pressure, or perhaps the mere occasion itself, although the Italians were energetic in outlook the game that was surprisingly even. As against the Austrians, it was Monti and his fellow midfielders that were key to denying the Czech thrusts. At the break, the game remained goalless. When the second-half got under way, it seemed that the dictator’s prompting had done little to improve matters. Monti was still stretched to contain the Czechs and it was little surprise when, with just less than 20 minutes to play, Italy fell behind. In a twelve-year career with the national team, Antonín Puč would score 34 goals in just 60 games, but probably none were as important as the time he turned on the edge of the Italian penalty area and fired past Gianpiero Combi to put the visitors ahead. Mussolini would not have been pleased, and the dread consequences of defeat would have been brought, front and centre, to the minds of the Azzurri. Indeed, over the next few minutes, the Czechs could have sealed the game – and the fate of their opponents. Jiri Subotka missed an open goal and then František Svoboda struck the upright with an effort. The chances squandered would be costly. The lead – and the increasing concern of the Italy players – lasted ten minutes. Into the last part of the game, just when it looked like defeat was becoming inevitable, Orsi fired home to bring the crowd and Mussolini to their feet. Now the momentum was with the home team and although the match went into extra-time, there was a growing feeling of inevitability about the outcome. Bologna’s Angelo Schiavio became the hero of the Fascist state driving low and across František Plánička, from a narrow angle, to net the winner. At full-time, with the Fascist anthem Giovinezza ringing in their ears, the Azzurri – complete with Monti and his two Argentine-born team-mates – were not only presented with the Jules Rimet trophy, but also a particularly large cup that Mussolini had specially commissioned for the moment, as he had considered the FIFA award too small to reflect the glory of the winners. Had the Czechs triumphed however, it’s likely that they would have had to satisfy themselves with the official trophy alone. All of those things were transient however. Luis Felipe Monti had written his name into the record books for his unique achievement. Not only had he won the World Cup for his adopted country, he was the only footballer ever to play in World Cup Finals for two different countries. Given modern day conditions, it’s difficult see how that would ever change. So, if you ever get asked that question, you now know the story and that the answer is Luis Monti.